Blowout Sale! 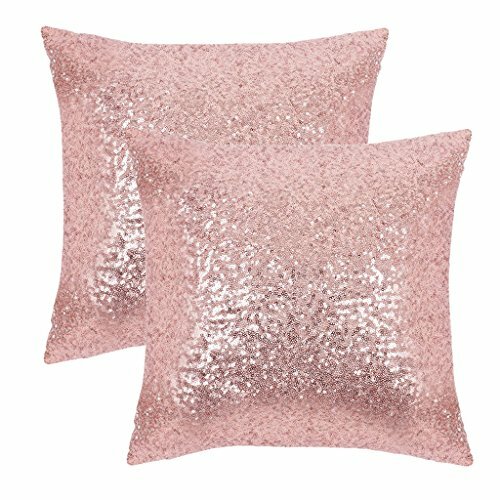 Save 51% on the PONY DANCE Home Decorative Sequins Cushion Covers Xmas Home Decor Luxurious Sequins Throw Pillow Cover Shams Glitter Pillowcases Including Hidden Zipper Design,18'' x 18'' Inch,Set of 2,Pink by PONY DANCE at Home Decor Outlet Store. MPN: S45RG2P. Hurry! Limited time offer. Offer valid only while supplies last. Want a Pillow Cover to for your home / wedding decor or special festival celebration? The PONY DANCE sequin pillow cover is a perfect choice for you. 1. The pillow cover features sparkling sequins,reflecting a look of luxury and creating a pleasant atmosphere. 2. Bring you with a comfortable sleep with its super durable fabric. 3. Improve your home, wedding decoration, party,Christmas or other events / festivals. 1. Fold the pillow insert before putting it into the pillowcase. 2. Keep it clean,do not soak in hot water,slightly spot clean,hang to dry. 3. It's normal for a few sequins to fall off due to the delicate nature of the material.Please simply shake them off and they will serve well. Please check our PONY DANCE storefront for more throw pillow cover styles and other deals that are waiting for you! All our products sold on Amazon.com enjoy 30-day full refund guarantee!You're taking no risk with your purchase of PONY DANCE products! READY MADE: 2 sequin pillow cases. size: 45x45cm(18"x18"). Unlike other pillow covers that may break off after a couple of months using, our covers are hand sewn and very durable. PILLOW INSERT IS NOT INCLUDED. EASY INSTALLATION: The smooth zipper - fit pillow perfectly,it is attached well and easy to open and close! the zipper hides well for a finished look! The opening is large enough to plug insert into the pillow cover. WIDE USAGE: The sequin pillow cover brings you fun and matches your home decor great! It's also great for people who like to fidget with their hands. Sequin pillow cover is perfect for Home, Party, Wedding & Formal Events! WASHING INSTRUCTIONS: When you wish to clean these sequin pillow cases, just dry wash or hand wash them carefully, then hang to dry! The sequin pillow cover enjoys AMAZON 30 days return policy! If you have any questions about this product by PONY DANCE, contact us by completing and submitting the form below. If you are looking for a specif part number, please include it with your message.